Can you and your friends eat a 7-pound meatball stuffed with cheese and spaghetti that’s larger than your head? If so, here's where you need to go. 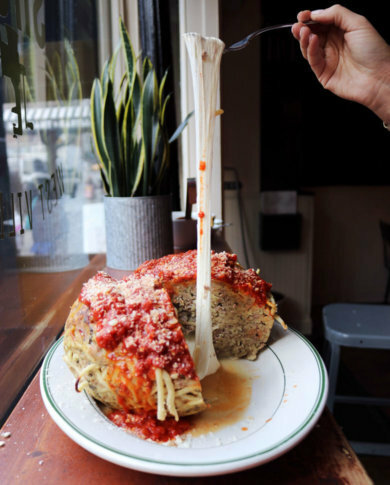 WASHINGTON — Can you and your friends eat a 7-pound meatball stuffed with cheese and spaghetti that’s larger than your head? If you think you can, then get to The Meatball Shop on 14th Street in D.C. But order ahead. It requires 24-hour advance notice, and will cost you, too — $150. The giant spaghetti-in-meatball will be offered from March 9 through March 31 at Meatball Shop’s 1720 14th St. location, which the New York City-based restaurant opened as its first outpost outside of the Big Apple last October. But that’s not the only meatball challenge up its sleeve. On March 9, The Meatball Shop will be holding its bucket-of-balls challenge. If you and a partner, can finish a bucket-of-balls – 25 of them – in 10 minutes or less, you and your partner will each get a $55 gift card and be entered into a grand prize contest. The grand prize winner will get a catered party for 6 at the 14th Street Meatball Shop. The Meatball Shop took space formerly occupied by Cork Wine Bar, which consolidated the wine bar with its 14th Street Cork Market last year. The first Meatball Shop opened in 2010 on Manhattan’s Lower East Side. There are now five locations in Manhattan and one in Brooklyn. The Meatball Shop menu includes six kinds of meatballs and five kinds of sauce, as well as mozzarella balls, risotto balls, buffalo balls and crab cake balls, along with salads and sides. Editor’s note: An earlier version of this story stated The 7-pound meatball would be on The Meatball Shop’s menu for $100. The company told WTOP it decided to change the price to $150 after evaluating the costs of the products used to make it. The Meatball Shop also revised the value of its Bucket of Balls gift card to $50, from $55 it initially stated.